NASA's Europa Clipper will conduct detailed reconnaissance of Jupiter's moon Europa and investigate whether the icy moon could harbor conditions suitable for life. The mission will place a spacecraft in orbit around Jupiter in order to perform a detailed investigation of Europa -- a world that shows strong evidence for an ocean of liquid water beneath its icy crust and which could host conditions favorable for life. The mission will send a highly capable, radiation-tolerant spacecraft into a long, looping orbit around Jupiter to perform repeated close flybys of the icy moon. NASA has selected nine science instruments for the mission. The selected payload includes cameras and spectrometers to produce high-resolution images of Europa's surface and determine its composition. An ice penetrating radar will determine the thickness of the moon's icy shell and search for subsurface lakes similar to those beneath Antarctica's ice sheet. The mission will also carry a magnetometer to measure the strength and direction of the moon's magnetic field, which will allow scientists to determine the depth and salinity of its ocean. Gravity measurements will also help confirm the existence of Europa's subsurface ocean. A thermal instrument will survey Europa's frozen surface in search of recent eruptions of warmer water at or near the surface, while additional instruments will search for evidence of water and tiny particles in the moon's thin atmosphere. NASA's Hubble Space Telescope observed water vapor above the south polar region of Europa in 2012, providing potential evidence of water plumes. If the plumes' existence is confirmed -- and they're linked to a subsurface ocean -- studying their composition will help scientists investigate the chemical makeup of Europa's potentially habitable environment while minimizing the need to drill through layers of ice. During the nominal mission, the spacecraft will perform 45 flybys of Europa at closest-approach altitudes varying from 1700 miles to 16 miles (2700 kilometers to 25 kilometers) above the surface. 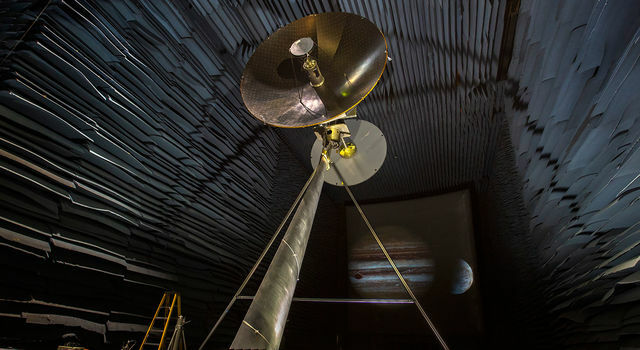 The indoor Experimental Test Range at NASA's Langley Research Center is putting a Europa Clipper antenna prototype through its paces, before the mission to Jupiter's moon. 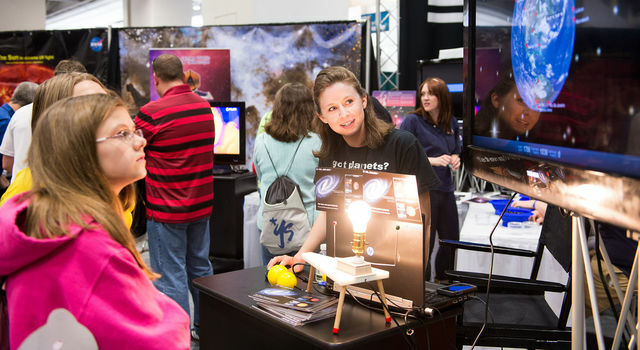 Explore the galaxy with NASA's JPL this weekend at a free STEM festival for Los Angeles students and families. 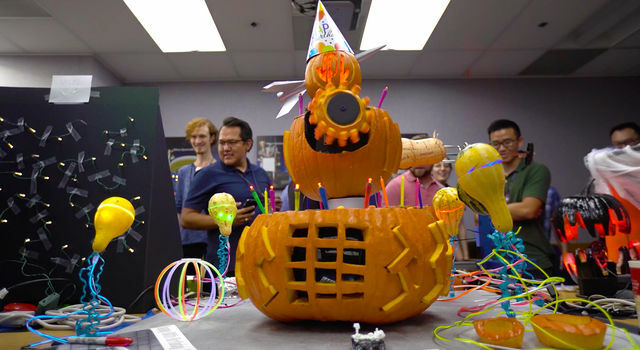 Every Halloween, JPLers take a brief break from building robots that explore the solar system and carve pumpkins that explore the outer reaches of creativity.